Your heart beats a little faster as you approach The Phoenician — a palatial resort commanding 250 acres at the foot of Camelback Mountain. But step inside its inner sanctum, The Canyon Suites at The Phoenician, A Luxury Collection Resort, and the opposite occurs: The pulse slows. The mind quiets. The muscles unwind. 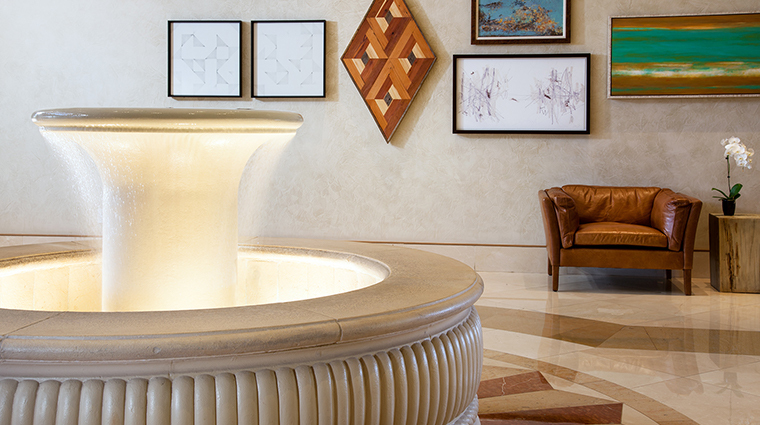 Tucked away from the main resort, this exclusive enclave is a hotel within a hotel. 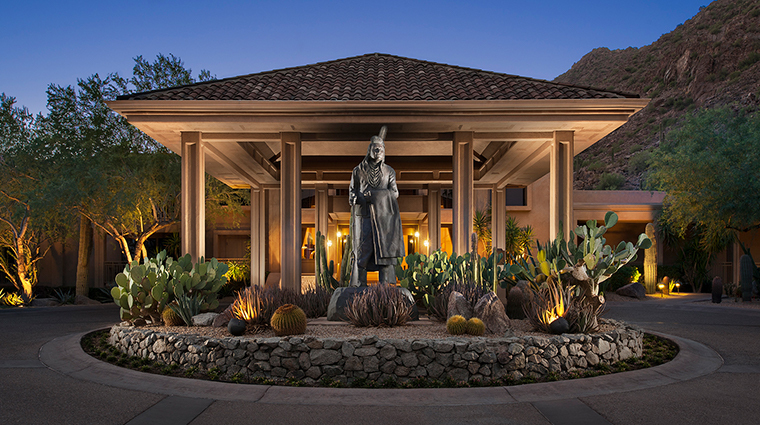 Following a complete remodel in mid-2016, the 60-room Canyon Suites now emphasizes the “desert” part of its identity. 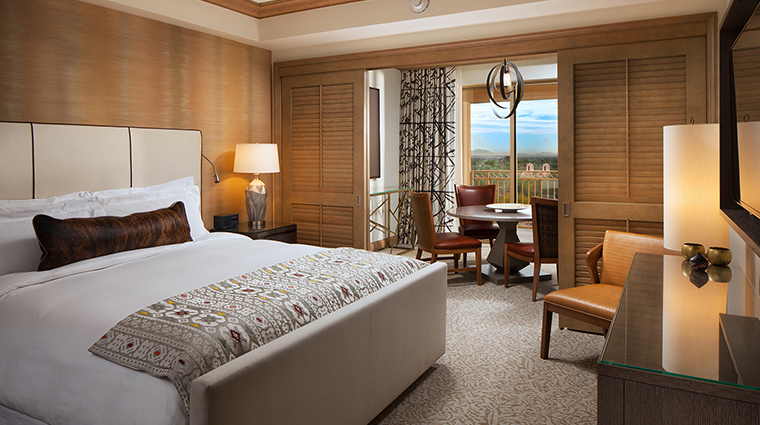 Earth-toned rooms feature Western accents, and adventures showcase the Sonoran surrounds. However, the “oasis” aspect remains unchanged. 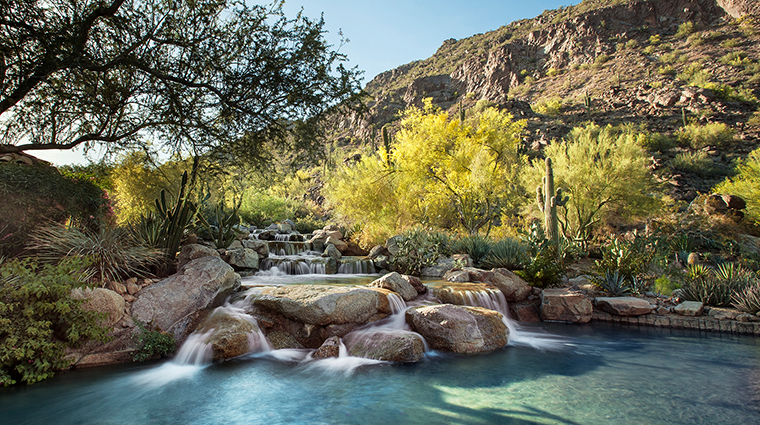 A waterfall cascades through a cactus garden, providing a soothing soundtrack of splashes. The private, palm-fringed pool is so serene you can hear the turning of paperback pages. 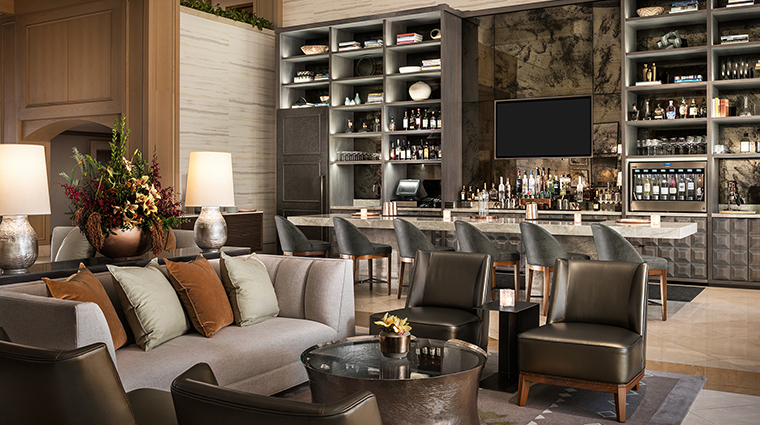 The Canyon Lounge is a cocoon of comfort complete with a roaring fire — perfect for when temperatures dip at night. 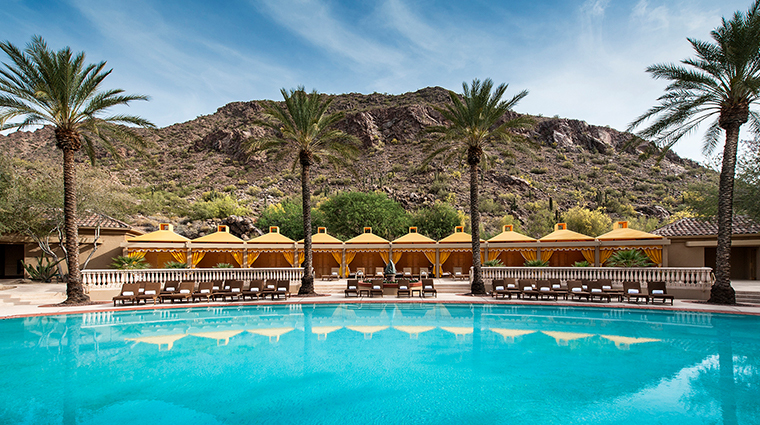 Except celebrity-worthy perks from the moment you arrive at this luxury resort— welcome gifts, priority reservations at all Phoenician restaurants and greetings by name from all hotel ambassadors are de rigueur here. You’ll never have to lift a finger at The Canyon Suites—free, provision-stocked backpacks are available for hikes, complimentary bicycles are available up on request and tennis equipment rentals come at no charge. At sunrise, ride a turbo golf cart on a Golf Course Safari. Your guide will teach you about indigenous plants while you scan the fairways for loping coyotes, vamoosing roadrunners and chuckwallas performing pushups on boulders. As if The Canyon Suites’ regular turndown service, with its lavender-sachet gift, isn’t soothing enough, upon request you can have a bath drawn and infused with a variety of spa salts. 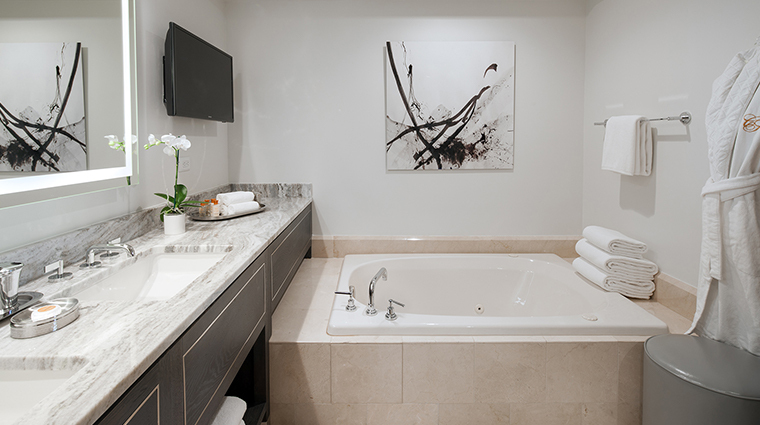 Between the bath and the plush bathrobe waiting nearby, you’ll be beyond relaxed. Though The Phoenician’s tiered pool area is impressive (the centerpiece relaxation pool sparkles thanks to its mother-of-pearl tiling), The Canyon Suites’ pool is much more private and surrounded by cabanas, cacti and landscaped waterfalls. 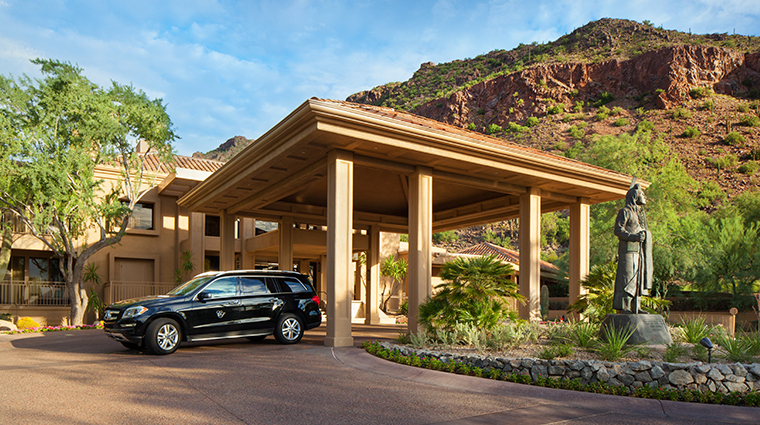 A chauffeur whisks you around The Phoenician and to nearby attractions, such as Old Town Scottsdale’s art and shopping district. 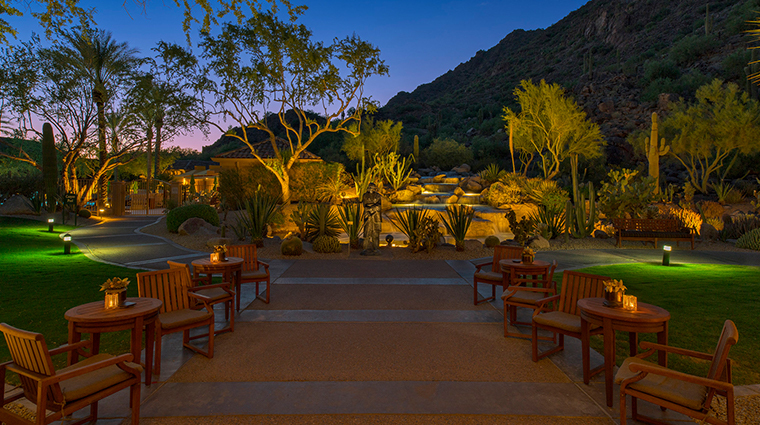 Come evening, take off in a helicopter from the driving range and zoom around Camelback Mountain as the sunset paints the terra-cotta-rocks red. 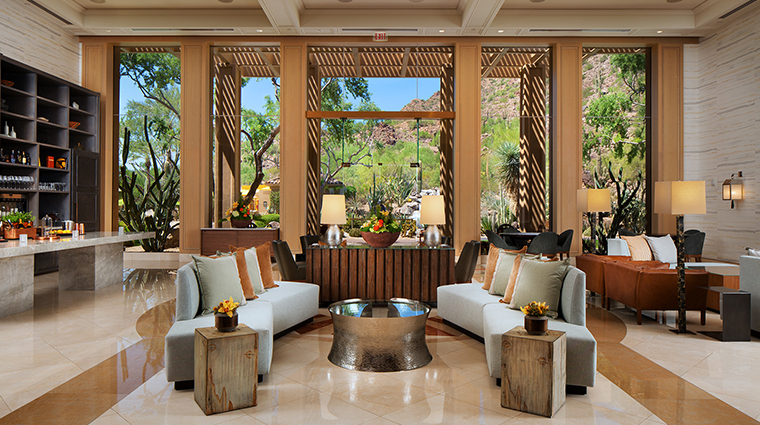 Unique activates make the desert their main focus at this luxury Scottsdale resort. From October through April, learn to soar through the air on a trapeze with the mountain as your dramatic backdrop. 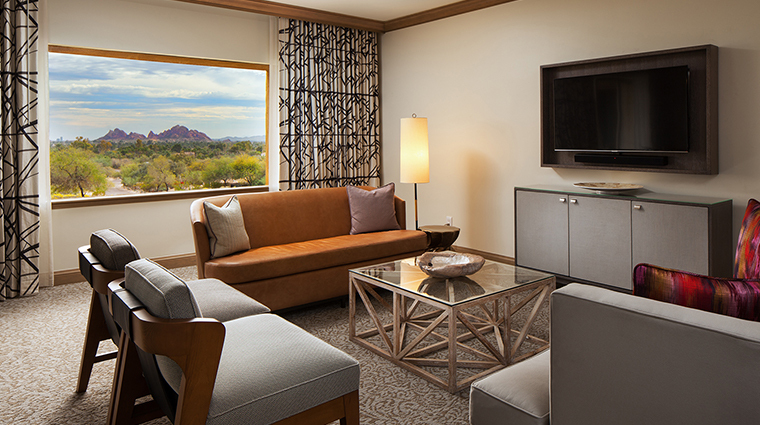 Thanks to the 2016 remodel, the rooms embrace the Sonoran Desert and contemporary sensibilities. The Southwest is reflected in the color palette: sand, buckskin, sumac maroon, blue agave. 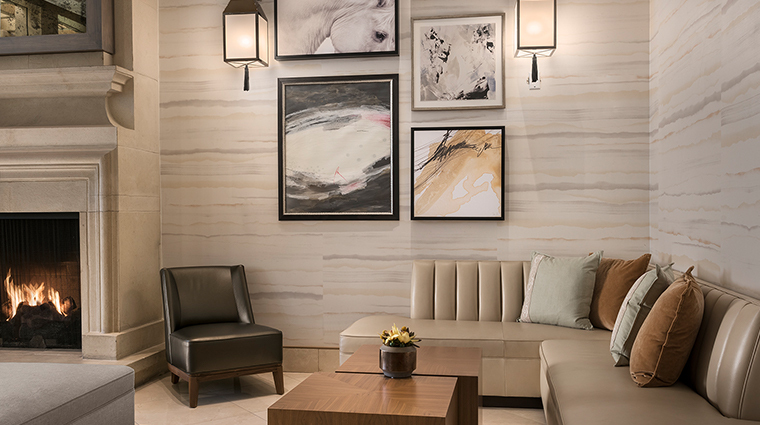 Locally sourced art pays homage to horses and evokes abstract sunsets, while carefully chosen textiles recall Native American rugs. 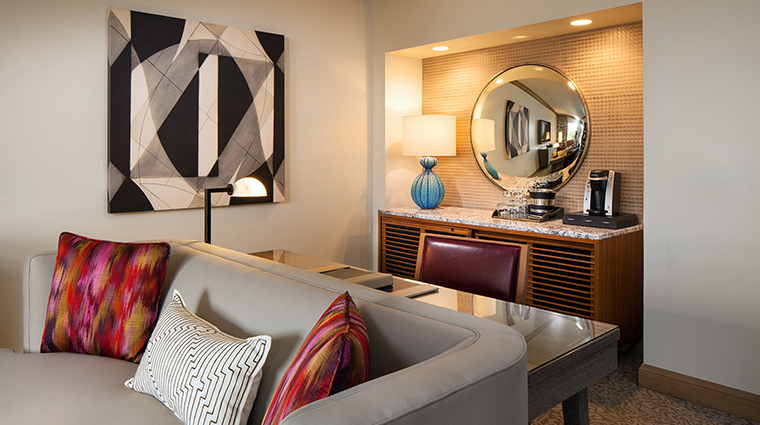 You’ll have a choice of accommodations ranging from the 600-square-foot guest rooms, one- to three-bedroom suites (1,200 to 3,000 square feet) or the presidential suite (2,400 square feet). 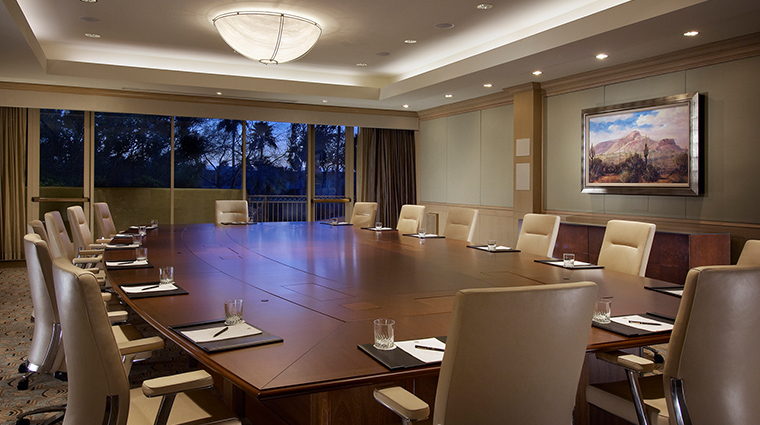 All guest rooms and suites open up to comfortable patios overlooking the pool and mountain or the 27-hole golf course. 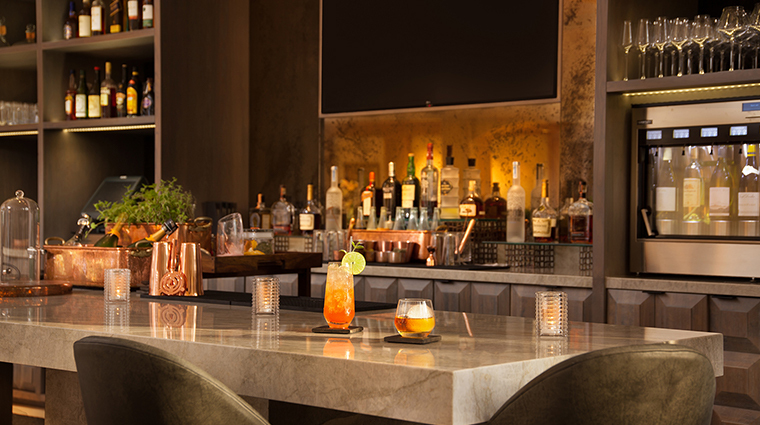 Communal and casual are the watchwords of the culinary scene at the Scottsdale hotel. 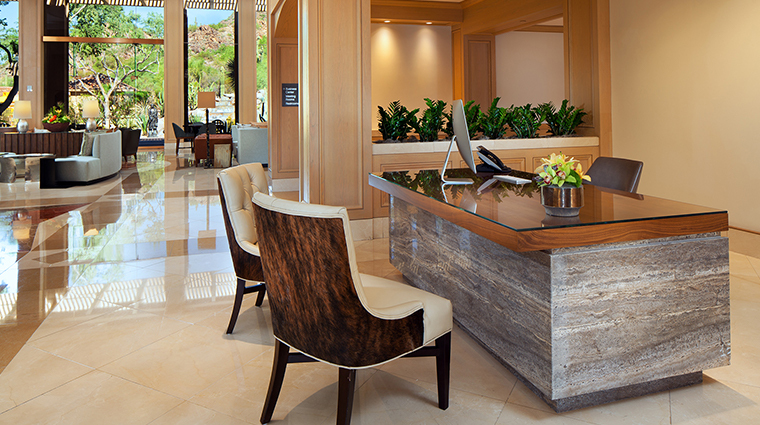 At breakfast, you’ll gather in the living-room-like lounge and select from a complimentary array of artisan treats. In the evenings, you’ll return to mingle over unique small plates and drinks, like caviar parfait and a smoked cocktail sweetened with mesquite honey. 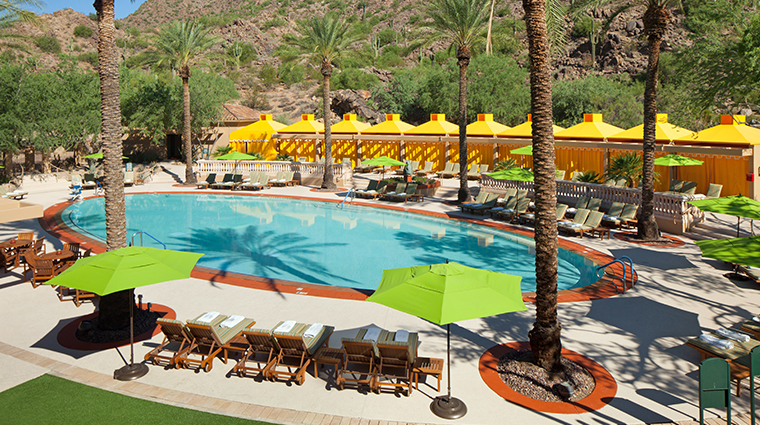 The poolside Canyon Grill will be key when you want to soak up some rays and some calories simultaneously. For more traditional dining digs, head to the main resort. There, you’ll find Relish Burger Bistro — a favorite of golfers — and J&G Steakhouse, which dazzles with its surf-meets-turf menu and spectacular city views.